Recently, I was doing an audit of my current AEG collection, and I realized that I was severely lacking in the AK department! Never one to settle for any old AEG, I wanted to jump into one of the new EBB AKs from CYMA; the CM050 series. I found one that touched on my love of PMC styled weaponry, and I knew that it had to be mine! Iâ€™ll be going over the good, the bad, and the just plain ugly parts of this gun in the following sections! The CM050 series is based on the Romanian PM md. 90 design, better known as the AIM. It is set apart from other AKs in the field by its side folding wire stock and, in the standard version, the wooden forward facing foregrip. Shooting the 7.62x39mm cartridge that is omnipresent in the AK47/AKM series, it offers decent power in a compact size, due to the folding stock. This weapon has been seen in the hands from such varying forces as the Romanian Navy, IRA, and even the Iraqi Police. 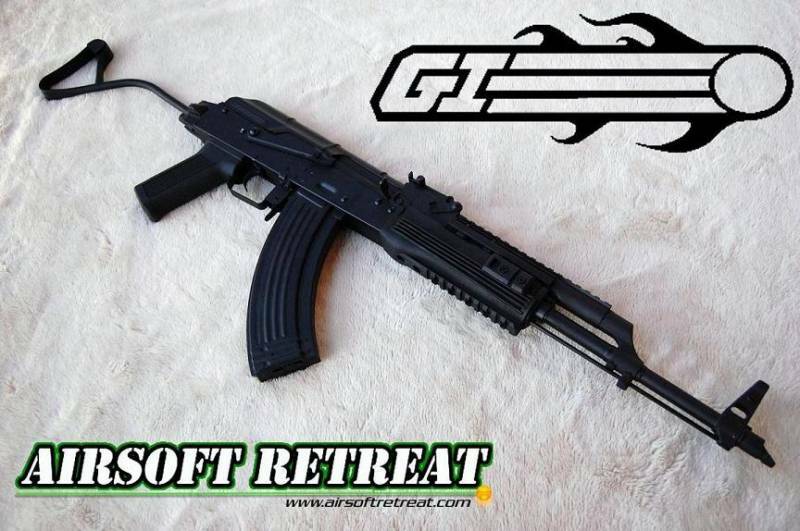 I was able to find this gun in stock at Airsoft GI, and they were kind enough to supply one in order to review it on Airsoft Retreat. There has been a lot of speculation about what type of EBB system this uses, and since there hasnâ€™t been a formal review of it that I can find, I hope to answer many of those questions about this series. The gun is available here priced at $205, making it eligible for ASGIâ€™s free shipping offer. I received this gun two days after it left ASGI, using UPS ground shipping, and it arrived perfectly, with no visible damage. The CM050 is an EBB AEG, utilizing a piston and spring driven blowback system to actuate the bolt during firing. It is constructed fully out of metal, with the exception of the pistol grip, handguard, and rubber pad inside the stock. It is CYMAâ€™s latest AEG offering, and hopefully CYMA can keep making guns of this quality! The gun arrived in a brown cardboard box emblazoned with images of a wooden gripped CM050 on the front. Inside, the gun was securely settled inside its foam cutout in the lower box. Everything has a good bit of foam protection to keep it from incurring damage during shipping. The box itself is sturdy enough to hold on to, to use as a transportation or shipping box. The foam in the lower was covered by a cardboard display piece, which makes for a professional looking package. Included with the CM050A package was the gun itself, an 8.4v 1400 mAh stick battery, trickle charger, front sight adjustment tool, manual, and a bag of cheapo-bbs. Most of the stuff was packaged in a little box inside the main box, with the battery hidden under a cardboard cover. CYMA has really stepped up their externals from the old CM028 days, with â€œfull metalâ€ being the norm now, and this gun is no exception. Theyâ€™ve recently moved up from their â€œpot metalâ€ construction to using steel in many of the parts of this gun, which Iâ€™ll cover in detail in the next few paragraphs. Starting with the stock, it is the standard Romanian side folding design, and is made of steel. It folds to the right, so you will still be able to use side mounted optics when you fold the stock. It is folded by pushing the little button at the rear, and swinging it to the right. My stock exhibited a terrible wobble, not just side to side, but up and down as well. I fixed this by putting a little strip of Velcro on the bottom of the folding mechanism to close the gap. This simple fix eliminated the wobble. The steel receiver is more or less a standard AK receiver, albeit with provisions for the side folding stock installed at the rear. Normal stuff here, selector on the right, scope mount on the left. The selector switch tends to unscrew itself, so some loctite would be a good idea. The selector markings are in Cyrillic, and are in the correct sequence. The bolt cover is also made of steel, and houses the battery compartment. The bolt can be pulled back manually to adjust the hop-up, but sometimes itâ€™s rough sliding forward. Oddly enough, itâ€™s pretty smooth when firing. Weird. You can fit a pretty long stick battery in there; my guess is up to a 10.8v, although I donâ€™t have any that big to test. The grip, trigger, and magazine release are all standard parts, although the grip does feel slightly more textured than CYMAâ€™s previous offerings. It feels good in your hand, albeit quite front heavy, as to be expected with a wire stock model. The trunion block is made of textured metal, but is not steel. It houses the rear sight, which is adjustable for elevation/range, and has painted markings. The handguard on this model is made of ABS plastic, and features rails on the sides and bottom. If youâ€™ve ever handled one of CYMA or JGâ€™s â€œTacticalâ€ AKs, this will feel right at home. The really unique piece is the aluminum gas tube, which is fully covered in a 20mm rail surface. You have about 6.75â€ of rail surface to work with here, which makes it perfect for holosights, reflex sights, long eye relief scopes, etc. The outer barrel is made of non-ferrous metal, and is standard AK47 length. It is terminated in the front sight assembly and an orange plastic slant style muzzle break. Underneath this muzzle break is a 14mm- threaded muzzle, suitable for mounting whatever you want up there. The sights are standard AK offerings, with both the front and rear units being adjustable for elevation, but not windage. Itâ€™s not my favorite sight design, but it certainly gets the job done. Overall, aside from a few glaring issues (stock wobble, auto-loosening selector switch), the externals are extremely well made. The finish looks and feels great, and the steel construction used in critical parts should translate into a very solid and long lasting AEG. Like most of CYMAâ€™s offerings, there are no trademarks, real or otherwise. The only markings on the gun are the Cyrillic selector switch markings. The included magazine is a 7.62x39mm style metal hi-cap, holding approximately 600 rounds. The gun is quite picky with mags, as Iâ€™ve tried other CYMA 47 and 74 mags, and ARMY 47 mags and havenâ€™t found one that fits. I need to figure out what the fitment issue is so I can develop a solution. The included mag, however, gets the job done nicely, and feeds quite well. Range and accuracy were good, but not spectacular. I was getting 150-160â€™ confirmed kills at my first skirmish with it, which, considering the power level, is a little low. A more effective hop-up bucking and a tightbore barrel would probably be a good investment, as they are with pretty much every gun. ROF with the stock 8.4v stick battery with about a 3/4 charge at 65* F, comes in at 12 RPS. Not bad considering it's shooting 420+ FPS, and is running the blowback system. An updated battery would help the ROF. The CM050A features a V3 gearbox, but with a special shell to allow for blowback operation. The modifications to the shell include a large slot cut into the side to allow for a little metal shuttle to sit, which gets pulled back by the piston. The gearbox itself is metal, and has metal bushings, which appear to be 7mm, but I need to measure it to verify. It has an automotive style blade fuse, coupled with a decent wiring harness. The piston looks to be that nylon/plastic blend thatâ€™s oh-so-popular nowadays. It has a metal spring guide, and a pretty hot spring, most likely in the M120-130 range, due to the FPS. You can pretty much go nuts with this gun, as itâ€™s an AK at its core. Lots of options out there for rails, barrels, etc. For my use, I have added a compact NCStar reflex sight to the gas tube, and a Type 89 clamp on bipod. Oddly enough, it fit the barrel and handguard perfectly, and looks nasty on there. Japanese/Romanian cooperation FTW. I wasnâ€™t expecting too much with the EBB AK series from CYMA, but I really was pleasantly surprised. It doesnâ€™t deliver earth shattering recoil when firing, but it is a fun little diversion to our normal BB spewing sewing machines. Plus, it makes you look like a PMC, which is automatically full of win. Many thanks again to Airsoft GI, Deadrag Airsoft Radio and of course, Airsoft Retreat! The issue with magazine well being very picky about magazines is because the VFC body has a rounded magwell as opposed to the squared magwell of the TM style bodies. If you sand the sides of your magazines front locking lip to a similar contour, it would probably fit. Found that out the hard way when one of my Ak mags got stuck, and I had to break the front locking lip to get it free.